Home-base authority with influence over your family? Church-based authority with influence over a ministry, department, or even an entire church? Regional authority with influence across a city, state, or states? Global authority with worldwide influence? 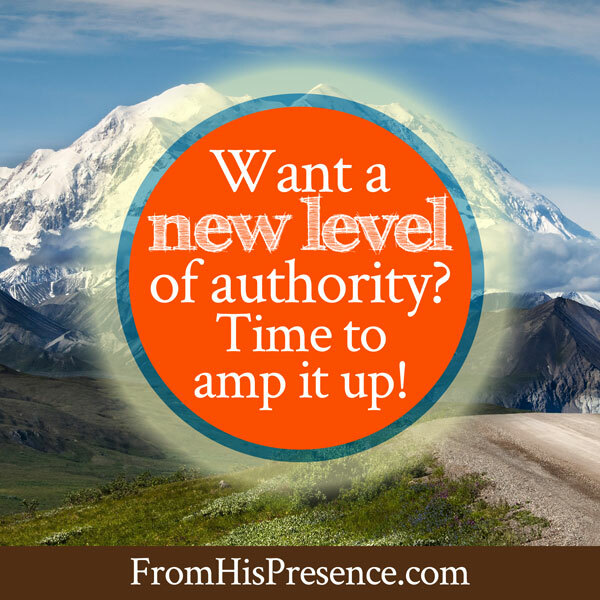 And to what level of authority and influence are you called? Because, beloved, if your current sphere doesn’t match your calling, I want to encourage you to amp it up today. I have a friend who recently became tired of her job in the medical field. She worked hard day in and day out, but she was extremely frustrated. Because no matter how hard she worked or how excellent her work was, she would always be the lowest-ranking person in the office. It wasn’t possible for her to climb any higher. My friend was frustrated and upset because the greatness God placed in her spirit was too large for her environment. She was feeling a bottleneck of anointing and power. All powered up, no place to go. So she applied for another job—and got it. The new job is a job with a huge company, a fantastic career path, and no limitations on how far she can go. She’s over-the-moon happy in her new environment, because now she can do work that is consistent with the dreams inside her. Does her story sound familiar? Are you in a similar place of dissatisfaction? Do you tolerate dishonor when, inwardly, you know you were made for honor? Are you barely scraping by financially every month when you know you are worth more than you earn—and that you could and should be doing well financially? Are you living to survive the moment, when you sense inwardly that you are called to do something that will leave a legacy to your children and to the generations after you? God honors both small and large circles of influence. However, throughout the Bible, God’s people are called over and over to have a worldwide influence. Is there something burning inside you that tells you that you are called to nations? If you’re called to authority in the home, and you feel that’s the purpose for which God made you, there’s everything right with that and nothing wrong with it at all. 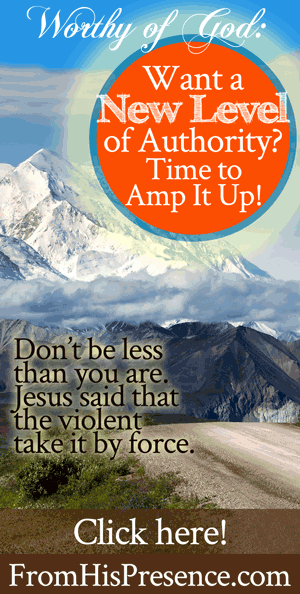 Take authority over your home and family, and rock it every day. If you’re already in that place and walking fully in your call, then you’ve got it made. But if you dream of a different scope and level of authority—if you dream of influencing your nation or even multiple nations—what are you doing to make that happen? Jesus said the violent take it by force. Today, on a scale of 1-10, Lou Engle has a “12” level of influence. He’s off the charts, and God placed him there—because Engle wasn’t afraid of being who he is. He wasn’t afraid to chase the dream. He wasn’t afraid to amp it up and chase the Voice. Recommended resources: Mark Batterson’s brand-new book Chase The Lion: If Your Dream Doesn’t Scare You, It’s Too Small is messing me up BIG-TIME. If this Worthy of God series about dreaming bigger dreams is rattling you, then please run don’t walk to get Chase the Lion. You can grab it on Amazon here (affiliate link). Also highly recommended: Erwin McManus’ book Seizing Your Divine Moment is an amazing, inspring, liberating book based on a story from the Bible about Jonathan and his armorbearer. This book is about the holy YES that God is speaking to you right now. 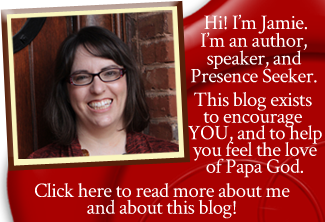 Check out Seizing Your Divine Moment here on Amazon (affiliate link). Either of these books would make fantastic Christmas gifts! So here’s the question: Are you also willing to chase the dream, the call, the Voice of your Beloved? This is not a guilt trip. If you’re not yet walking in the level of authority to which you’ve been called, that’s okay. Life and growth and ministry and calling and influence are all PROCESSES. But the real, telling issue is this: are you taking steps that will help you arrive at that level of influence? Because if you’re not taking steps that will get you to that level of influence, then I need to ask you this deep, probing question: why aren’t you? Fear of what other people will think. Fear of being seen as power-hungry or negatively ambitious. Fear of trying again in case they fail again. And for those of you who are afraid, I want to speak this word to you today: Beloved, don’t be less than you are. Who you are was ordained by God Himself before the foundation of the world. God the Father, the Creator, Maker of Heaven and Earth, conceived you in His mind’s eye long before your mother’s egg and your father’s sperm came together. Who you are is not determined by what other people think about you. And who you are is not determined by who acknowledges who you are. Oh, that’ll preach right there. Let me say that again: who you are is not determined by who acknowledges who you are. It’s not up to other people to approve or disapprove of your call and your DNA. Who you are was divinely ordained by the one and only Living God–the God who knew you before He formed you in the womb. God put you on earth at this time and in this place for a purpose. You have a voice that no one else on the planet has. You can have influence that no one else in the world can have. Your message, your story, and your life can reach people for Jesus in a way that no other person can ever do. YOU. YOU are God’s agent of the hour. You can shape history. 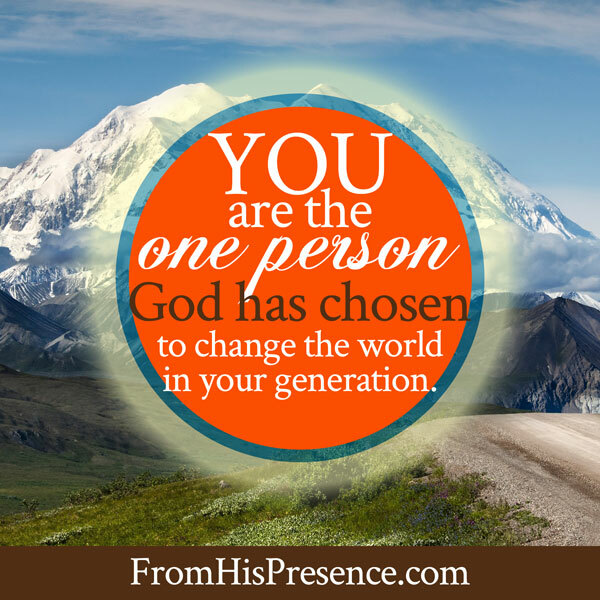 YOU are the one person God has chosen to change the world in your generation. You can click the image to share it on Facebook. Do you have to be under authority? Yes. As I taught in Kingdom Authority 101, YOU MUST BE UNDER AUTHORITY IF YOU WANT TO HAVE AUTHORITY. You can only have authority to the extent that you have submitted yourself to someone else’s authority. Period. So don’t be less than you are, beloved. It’s time to stop drawing back, stop holding back, and stop trying to diminish who and what God has made you to be. It’s time to stop trying to fit in. It’s time to blow the mold wide open with the explosive force and power that God calls you. God our Father made you who you are. Only you can do what He has created you to do. And you can only thrive when you’re being the fullest, most complete, most genuine, true-to-creation YOU that you can possibly be. You can’t thrive trying to be more than you are. That is easy to grasp. No one has a problem with that. But you also can’t thrive trying to be LESS than you are, and that’s the challenging part. Requires you to own up to God’s call on your life. Requires you to live between you and God alone; not you, God, and pleasing people. It may even require you to own up to your call publicly, rising out of the mediocrity of pitiful poor-mouthing so you can do something powerful with your life. But if you refuse to acknowledge who you are and who God made you to be, you are robbing yourself, robbing the world, and insulting God. Where would we be if Edison had refused to see himself as an inventor? If Thomas Jefferson had refused to see himself as a champion of liberty? If King David had not believed that he could write songs? Where would we be if Jesus had refused to see Himself as the Savior of the world? Ah no, beloved. Don’t insult the Holy Spirit by refusing to acknowledge who and what He has made you to be, to do, and even to become. Don’t insult His work in your life. Don’t insult His call on your life. Don’t fail to steward the gifts He has given you and who He has formed you to be. You can arrive at the place to which you’re called, one step at a time. Papa God has called you to this. It doesn’t matter what people will think. You’re a lover of God and of people, and you love both God and people so much that you aren’t going to let the world suffer for lack of your influence. You are a warrior. You were born for this. So go ahead. Go big until we go Home. Don’t be less than you are. It’s time to amp it up. Is this word resonating in your heart today? If so, leave a comment below. I’d love to hear from you! •Fear of what other people will think. •Fear of being seen as power-hungry or ambitious in an ungodly way. •Fear of trying again in case they fail again. Fear steals all from us, and whilst we have been set free and our sins paid for, we still allow the enemy in because we fear the world and its ways. Thanks you your messages are awesome and I have taken the (prayer to reverse the situation) and I will not cringe or take the hammering anymore, I need your prayer to enfore the Psalm 43 and 44. Leon, I’m thrilled that Holy Spirit is encouraging you and speaking to you. May He “amp up” His voice in your hearing and empower you with BOLDNESS to complete His entire purpose for your life, in Jesus’ name! I think I had the opposite problem of your friend. I tried to get jobs that were what I’d call “real ” jobs, I can even remember crying about that, not getting ahead, but that wasn’t what He wanted me to do, so now I find myself back out there again helping people and knowing a writing career wasn’t my imagination but His. If He’s called you to it, He’s going to make it happen, sister! He always opens doors for those whom He calls. If you’re not already doing so, remember to pray specifically for those open doors and for relationships with editors and publishing outlets! Relationships are so important in this industry. Wow, JULIE! I praise God with you! It sounds like you are on the verge of something wonderful! Whatever the vision Father has laid on your heart, know that He is saying YES to your dream, which is really HIS dream! And more than anything, know that YOU are God’s dream! He dreamed of you since eternity past and one day He wrapped a body around you and placed you on this earth for such a time as this. Raise her up, Abba Father, into Your purposes in Jesus’ name! I can only say your timing is impeccable Jamie ! I have just seen this scripture about the” violent lay hold of the kingdom by force”, and it has come up in conversation several times ! Maybe I should be saying God’s timing is impeccable ! Words are not enough to describe this message you shared to us.